UPDATE: Lisa Adams informed the community council at the April 6th meeting that the petitioner for this project withdrew their proposal. This project is no longer being considered. On March 9, 2016 the planning commission voted unanimously to forward a negative recommendation to the city council on this petition. This issue now goes to the city council for a vote. No date has been scheduled yet for the city council to address this issue. NOW is the time to let them know how you feel. Email all council members at council.comments@slcgov.com. This issue will be on the March 9th planning commission meeting. The formal agenda has been put online for that meeting. This agenda includes the official report from the planning office. Please plan on attending this evening meeting to voice your comments on this project. 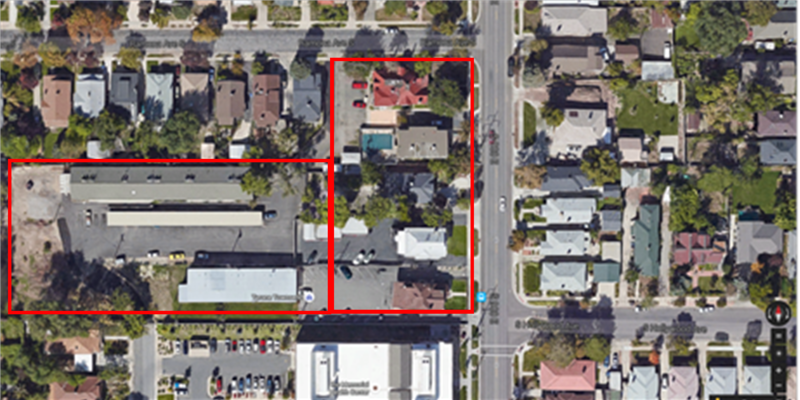 A petition to rezone and amend the Sugar House Master Plan has been filed with Salt Lake City. The proposal would rezone the following 8 parcels from Residential Multi Family (RMF) -35 to Residential Multi Unit (R-MU)-45. We have invited the developer to give a presentation at our Land Use & Zoning Committee meeting to be held December 21st, 6:00 p.m. at Sprague Library. You can comment using the form below as well. We will also invite the developer to give a shorter presentation at our general meeting January 6, 2015. Salt Lake City Planning has put together an Information Sheet that provides a lot of good information on the comparisons of the zones and provides the actual ordinance language. The height allowed is greater by 10 feet, but the density allowed is 3x the amount. A breakdown of units per acre is also provided in the Information Sheet. The following table also helps illustrate some of the differences between RMF-35 and R-MU-45. The following tables show some of the major differences between the RMF-35 and R-MU-45 zones for a development of this type and scale..
(10’ and 10’ for corner lots) 35’ 60% max When abutting a single or two-family zone, landscape buffers are required. 50 ‘ min (multi-family development) 5000 sq ft for new lots 5’ min, 15’ max 25% of lot depth (not more than 30’) 10’ + 1’ for every foot increase above 30’ (when abutting a single or two family residential district. No set back otherwise) (Corner side yard 5’ min and 15’ max) 45’ max (when abutting a single or two-family zone) 80% max (at least 20% has to remain as open space) When abutting a single or two-family zone, landscape buffers are required.